A record of our past events and other information. 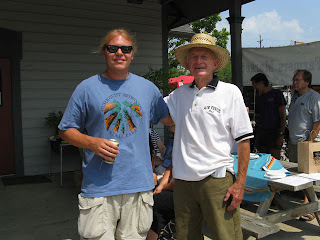 Shown here from left are first and second prize Tomato Contest winners Adam Tobler of Elgin and Norm Thomas of East Dundee. [Aug. 18, 2009, East Dundee] Kelp, bat guano and mushroom compost provided an aromatic but effective competitive advantage to this year’s winning tomato in the largest tomato contest held Saturday at the Dundee Township Visitor’s Center. Elgin resident Adam Tobler, 25, took first prize with his 1-pound 8 3/8-ounce tomato that he said was grown with only natural fertilizers. There were 22 entries of all shapes, sizes, colors and ripeness ranging from a bright yellow jelly bean-sized grape tomato to giant love apples that resembled misshapen softballs. This summer’s mild temperatures yielded smaller entries, but no less enthusiastic participants, said event organizer and visitor’s center board member Bill Zelsdorf of Carpentersville. Tobler said last year’s entry didn’t even place at 2 and ¼ pounds, so he wasn’t hopeful when he picked his 2009 entry off of one of 12 plants in his garden. But he took home $500 in gift certificates and prizes from area businesses, including a gift bag from One Cut Above the Rest, a wisteria tree and rose bushes from Dundee Landscape Nursery, Old Country Buffet meal passes, Classic Cinemas movie passes, and gift certificates from Diamond Jim’s tavern, Manor restaurant, Piece-A-Cake bakery, and Liberty Lanes bowling ally. Mary Albright, 43, of Hoffman Estates came in second with a tomato of the same weight, but a later entry time (entry time was the tie breaker). She won $300 worth of prizes, including a Dundee history book by Phil Aleo; merchandise from Haeger Potteries and Dundee Landscape Nursery; and gift certificates from Liberty Lanes, Red Lobster, Classic Cinemas, Diamond Jim’s, and Piece-A-Cake Bakery. Sydney Thomas, 8, of Colorado took third place with a 1-pound 6 5/8-oz tomato, while her grandpa, Norm Thomas, 82, of East Dundee went home with fourth place. His tomato weighed 1 pound 4 1/8 ounces. They won $200 and $150 in prizes respectively from many of the same generous prize donors, plus gift certificates from Jewel/Osco, Olive Garden, Dairy Queen, Barb’s Studio 104 and Denny’s Restaurant. “Sydney will be so happy,” Thomas said, “she really worked hard on them.” Thomas said there were no secrets to their success other than diligent weeding. “I don’t even fertilize them,” he added. The Visitor’s Center will host its Great Pumpkin contest on October 31, with prizes for heaviest pumpkin and best decorated or carved pumpkin. Congratulations to our winners, and thanks to all who entered! 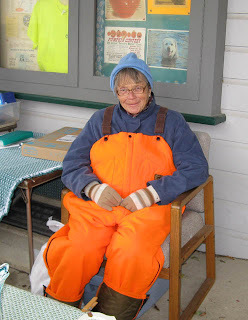 Our favorite "Great Pumpkin," June, our dedicated Farmer's Market manager, retired in 2009. Here she is sporting her stylish way of staying warm! Thanks for everything, June! [Oct. 31, 2009, East Dundee, IL] Never mind kind words, moonlight serenades, or exotic fertilizer. The secret to great pumpkins, it seems, is all in the seeds. 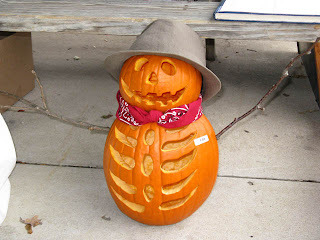 Proof lies in this year’s winners of the Great Pumpkin contest hosted by the Dundee Township Visitor’s Center. Area businesses donated over $1,100 in prizes that went to winners in two categories: heaviest (by weight) and best decorated/carved. The 11th-annual contest also marked the end of the season for the Dundee Farmer's Market. A 117-pound gourd grown by Susan Bird of Carpentersville took first place for largest pumpkin. A veteran competitor, Bird won second place last year and third place the year before. She said she saves the seeds from her largest pumpkin and then plants them the following year. “Each year, they get a little bigger,“ she said. Bird won $300 in merchandise and gift certificates. Jim Wolff of Marengo came in second with a 100-pound pumpkin that he grew from saved seeds as well. “I save the seeds from year to year and keep the weeds out of the pumpkin patch,” he said, “that’s about all I do, I don‘t talk to them or sing songs or anything.” Wolff, who is also a produce vendor at the market, took home $165 in gift certificates from area businesses. Joe Bobitt of Carpentersville came in a close third place, winning $100 in gift certificates for his bright orange pumpkin that weighed in at 93 pounds. Fifteen creative entries gave the panel of 10 judges a challenge, since only the top three vote getters took home prizes for best decorated/carved pumpkins. Designs included a grinning skeleton, a shy ghost, and a tragic love triangle. Karen Nedli of Carpentersville used a white pumpkin and her daughter’s recent wedding as inspiration for her third-place “bride of Frankenstein” entry, complete with bridal bling and airline tickets for the honeymoon. Peter Culver put his wood carving skills to work and took home second place for a two-pumpkin sculpture depicting the East Dundee logo and a train at the depot. 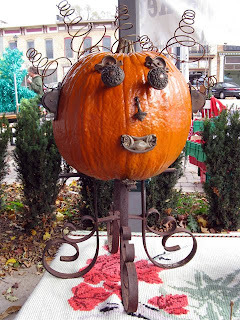 First place went to Maple Park‘s Sandy Deutsch for “Ugly Beddy,” a shiny orange gourd festooned with springs, handles, doorknobs and other antique hardware that made for a grinning jack-o-sculpture entry that doubled as a DIY supply center. “It was a great turnout, despite the cold weather,” said event organizer Bill Zelsdorf of Carpentersville. “We really had some great entries, and we’re always so grateful to the businesses that donate all the prizes – despite these hard times, we had over to $1,100 in prizes.” Donations included merchandise and gift certificates from Dundee Dairy Queen, Piece-A-Cake Bakery, One Cut Above the Rest salon, Barb’s Studio 104, Olive Garden, Dundee Landscape & Nursery, Liberty Lanes, Dundee Manor restaurant, Denny’s, West Dundee’s Jewel/Osco, Old Country Buffet, Phil Aleo, and Diamond Jim’s restaurant. The Visitor’s Center will remain open weekends through December 5th. 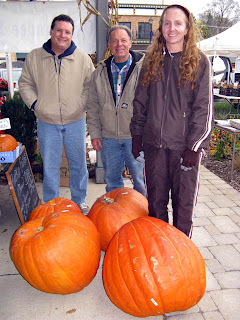 The Farmer's Market will end its 2010 season Oct. 30. Shown here from left are third-, second- and first-place winners for largest pumpkins: Joe Bobbitt of Carpentersville (93 pounds), Jim Wolff of Marengo (100 pounds), and Susan Bird of Carpentersville (117 pounds). This is the 11th year the Dundee Township Visitor’s Center has hosted the contest. The three winners took home a combined value of $565 in prizes and gift certificates. 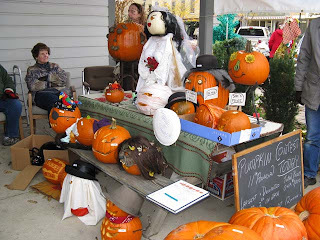 Fifteen creative entries gave the panel of 10 judges a challenge at the 11th-annual Great Pumpkin Contest hosted by the Dundee Township Visitor‘s Center. Winning designs included a hopeful bride, a hand-carved mural of East Dundee, and grinning jack-o-sculpture festooned with a variety of antique hardware that doubled as a DIY supply center. 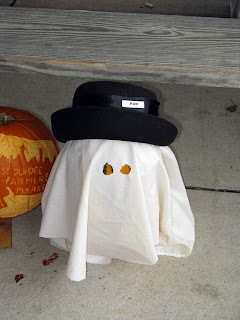 Other favorites included a grinning skeleton, a shy ghost, and a tragic love triangle. First place winner in the 11th-annual Great Pumpkin Contest hosted by the Dundee Township Visitor‘s Center went to Maple Park‘s Sandy Deutsch for “Ugly Beddy,” a shiny orange gourd festooned with springs, handles, doorknobs and other antique hardware that made for a grinning jack-o-sculpture entry that doubled as a DIY supply center.